When prince Roy's kingdom of Lycia is invaded by the forces of Bern, he sets out with an army to bring peace back to his kingdom. Along the way he must search for the legendary Binding Blade that will help bring an end to the occupation. Each stage is set up as a map from a birds eye view with friend and enemy units arranged on the map. Your army must overcome the enemies on each stage in automatic battles judged by each unit's individual statistics. When a unit battles it earns experience points, but if a unit falls in battle then it's lost for good. 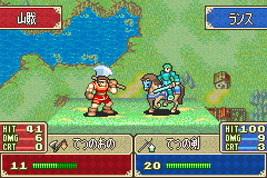 If Roy is lost in battle then you fail that chapter and must restart.